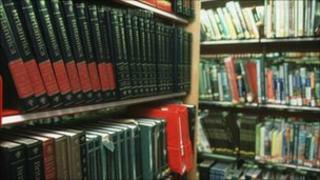 Nine of the 11 libraries on the Isle of Wight could close as the council tries to save £32m over the next four years. Under the plans, only two would remain - at Newport and Ryde. The council hopes community groups will take over services in other areas. The move is expected to save £633,000 in the year to April 2012 and £835,000 the following year. The current annual cost of the service is £1.7m. A five-week public consultation period will begin on 4 January. The plans include enhancement of the libraries at Newport and Ryde, which will open for 50 hours a week. Cowes, Sandown, Ventnor and Freshwater libraries would remain open until 31 March 2012 to allow community-run libraries to be set up. East Cowes, Bembridge, Shanklin, Niton and Brighstone libraries are due to close on 31 March 2011. It is hoped that voluntary sector organisations will provide home services to people unable to leave their homes. The library service currently employs 81 staff in full-time and part-time roles.